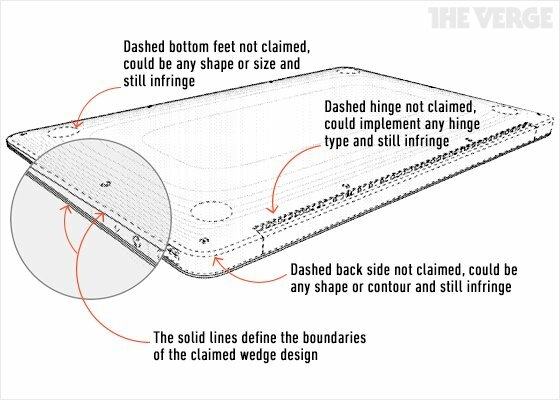 The Verge noticed Apple was granted a patent for laptops with a distinctive wedge or teardrop profile. Lets hope this won't lead to another round of patent trolling. With design patents it's all about the drawings. There isn't much in terms of a written description to go by, so the nuances of the drawings define the enforceable protection of the patent. And as always, the coverage centers around the details of the solid lines in those drawings. The dashed lines provide context, but do not at all define what is patented. In determining infringement, courts look at whether the allegedly infringing device and the design patent are substantially similar in overall appearance to an "ordinary observer," excluding minor differences. You can see below how Apple has dashed out the unimportant details of the notebook, like the rear contour, hinge, side ports and feet, and instead focuses on the overall wedge shape and look of the device with solid lines. That's the aesthetic Apple has patented here and a notebook with hinges, feet or a shaped back different than the MacBook Air could still be infringing as long as the rest — primarily the claimed wedge profile — is substantially similar. On the other hand, competitors can still rely on meaningful tweaks to the angles, shapes and proportions of their notebook designs to avoid the patent — that's how patent design-arounds work.